Try TWO "Dance Scottish" Classes for FREE! Fall Semester at HALF PRICE! 2 Free classes plus 15 more for only $40! That’s less than $3 a class! * Great Music from the best Scottish Dance Bands around! New dancers are accepted all through the dancing season, especially following the January Burns Dinner and Ball. No partner is necessary! No previous dance experience is necessary! Footwear at the first few lessons should be light, flexible soled shoes, sneakers or dance slippers. Doors open at 7:00 to prepare for dancing at 7:15. Dancing will begin with warm-ups followed by a review of the steps and formations to be used in the Scottish Country Dances that evening. Click here to request weekly updates and/or be added our mailing list! Check out our NEW Brochure!! OPEN HOUSE ! !NEW DANCERS WELCOME ANYTIME!! For more information contact Sara Lynn Johnson. exit West. Proceed on Main Street (Route 5) west toward downtown Buffalo. (Washington Hwy.). Five traffic signals have been passed. Amherst Community Church is on the right side. Scottish Country Dancing is a distinctive, historical form of social dancing. Despite its title, Scottish Country dancing should not be mistaken for a form of folk dancing or Highland dancing. It was not only danced by the common folk, but also by the elite. The elegance, manners, and footwork of the Scottish Country Dance has its roots both in French Ballet and the French Court. In 17th century Scotland, this French base, combined with Celtic dance patterns danced for centuries by the Scots, resulted in an extraordinary musical form of dance. It embodied not only grace, but also an exhilarating spirit! Thanks to the social pattern of Scotland, Scottish Country Dancing has never died. By contrast, the country ballroom dances of England, Ireland and Wales became unfashionable, and nearly forgotten. As a result of Scotland's clan system, where the Clan Chieftains’ interests became those of their kin, the Clan Chieftains’ demands for dancing were greatly responsible for its continuation. This socially inclusive tradition made Scottish Country Dancing accessible to all, from the barn to the ballroom. Until this century, Scottish country dances were communicated strictly by word of mouth. This assured the preservation of traditions, while at the same time allowing for a certain amount of Scottish dance evolution. However, by early in the 20th Century, American and European ballroom dancing had begun to exert an extraordinary influence; Scotland's unique dancing was about to evolve itself into extinction! In 1923, the Scottish Country Dance Society was formed to preserve Scottish county dances. As the British Royal family has long been enthusiastic participants in Scottish Country Dancing, King George VI bestowed the title of Royal on the Society in 1951. Thanks to the efforts of the Royal Scottish Country Dance Society, we can now enjoy the spirit and grace of authentic Scottish Country Dancing around the world! 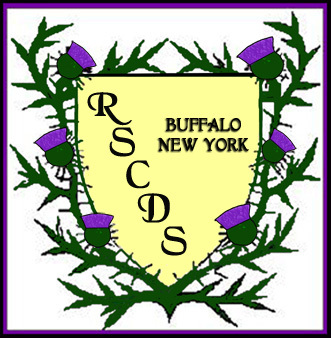 In 1979 the Buffalo Branch was officially accepted as a branch of the Royal Scottish Country Dance Society. YOU ARE VISITOR NUMBER SINCE December 7, 2009.